Download the PDF flyer for the lectures here. Those interested in mathematics, origami, or love were treated to one of the free public lectures at MATRIX 2016. Start with a sheet of paper. By folding, crumpling, sometimes tearing, we will explore a variety of phenomena, from magic tricks and geometry to elasticity and the traditional Japanese art of origami. Much of the show consists of table-top demos, which you can try later with friends and family. 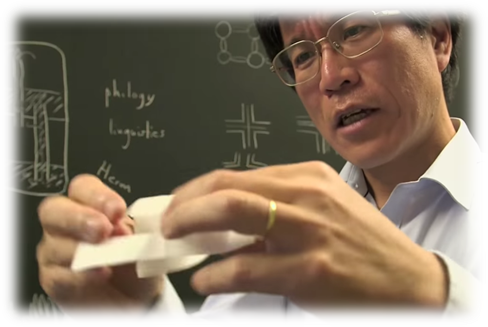 Tadashi Tokieda has attracted worldwide attention for his work connecting maths and science with toys and origami. Having worked as a painter in Japan and as a classical philologist in France, he is now a mathematician at Stanford and Cambridge, and is active in outreach in the developing world, especially via the African Institute for Mathematical Sciences. You’d be forgiven for thinking that love and maths don’t naturally sit well together. Equations and proofs seem pretty poorly equipped to capture the thrill of romance or the world-ending despair that love can bring. But love – as with most of life – is full of patterns which mathematics is uniquely placed to describe. What are my chances of finding love? What profile picture should I use to maximise my chances in online dating? When should I settle down? And how can I avoid divorce? Sometimes serious and sometimes playful, Hannah will take us on a tour of the most talked about subject in history – using maths as our guide. Dr. Hannah Fry, a lecturer in the Mathematics of Cities at University College London, has contributed to several BBC documentaries including City in the Sky (BBC 2), Trainspotting Live (BBC 4), and The Joy of Data (BBC 4).